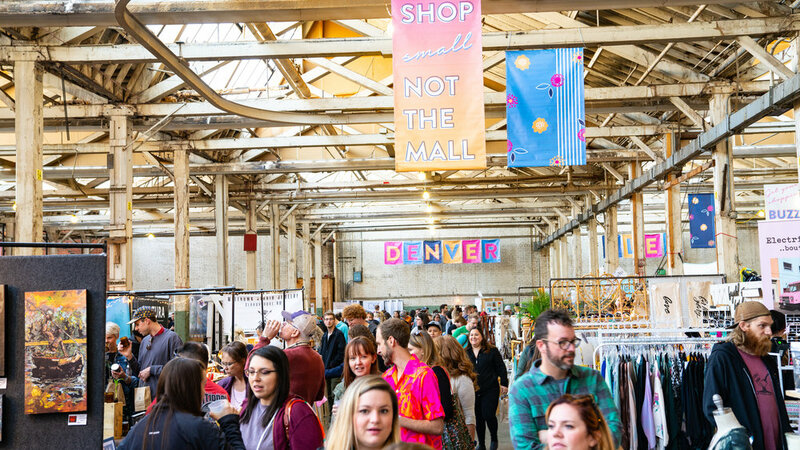 DENVER — February 28, 2019 — Denver Flea, the seasonal modern pop-up markets that have brought together small businesses and consumers across Denver since 2014, is excited to announce its new name — Fetch Markets. The company’s next event is Fetch Spring Market, slated for April 12-14. Fetch Shop, a brick-and-mortar retail store that will sell goods from a variety of small businesses and creators, will open this spring at Dairy Block in Downtown Denver. In 2018, there were 19 days of markets that offered goods from more than 650 vendors and were attended by more than 90,000 shoppers. The markets in 2018 alone had a $6 million impact on the Denver economy. This led to Adams’ commitment to a permanent brick-and-mortar shop, in addition to hosting continued quarterly outdoor markets. The Fetch Spring Market will take place April 12 - 14 in RiNo at the Coors Field parking garage in RiNo located at 27th and Blake Street. The market will be held on Friday, April 12 from 6-9 p.m., Saturday, April 13 from 10 a.m.-6 p.m. and on Sunday, April 14 from 10 a.m.-5 p.m. The market is expected to have 150 vendors. Fetch Shop, the retail store, is slated to open in Spring 2019. The store will sell goods from up to 20 vendors from Colorado and beyond. The 3,000-square-foot shop will be located at 1855 Blake Street adjacent to the Blake Street pedestrian alley at Dairy Block. The shop is directly connected to the Blanchard Wines tasting room, providing shoppers with the chance to enjoy a taste of Blanchard's varietals before or after they shop. Confirmed shop vendors include Vert Beauty, Bjorn's Colorado Honey, LVTD Design, Bridget Dorr Ceramics, Old Pine Candle Co., Union Stitch & Design, Rocky Mountain Posters, Parks Project and Oil & Lumber. The first Denver Flea was held in 2014 at City Park, where 30 local vendors sold goods to 5,000 attendees for one day. The latest Union Station Holiday Market by Denver Flea was held for 12 days over four weekends, with 350 vendors and 50,000 attendees. For more information visit www.thisisfetch.com, follow us on Instagram and like us on Facebook. Fetch is a retail incubation and lifestyle company that creates unique shopping experiences, directly connecting curious shoppers with emerging brands, artists and passionate creators. Fetch provides small businesses with sales and marketing platforms beyond traditional retail models. We do this by connecting passionate creators directly with engaged and interested shoppers while also providing opportunities for continued growth and financial success. Fetch hosts quarterly Fetch Markets, where hundreds of makers sell goods to the community at different venues in Denver. Dates and times of markets vary. Fetch Shop, a retail store, is slated to open in Spring 2019 at Dairy Block in downtown Denver. The 3,000-square-foot store will sell goods from up to 20 vendors from Colorado and beyond. For more information visit www.thisisfetch.com, follow us on Instagram and like us on Facebook.